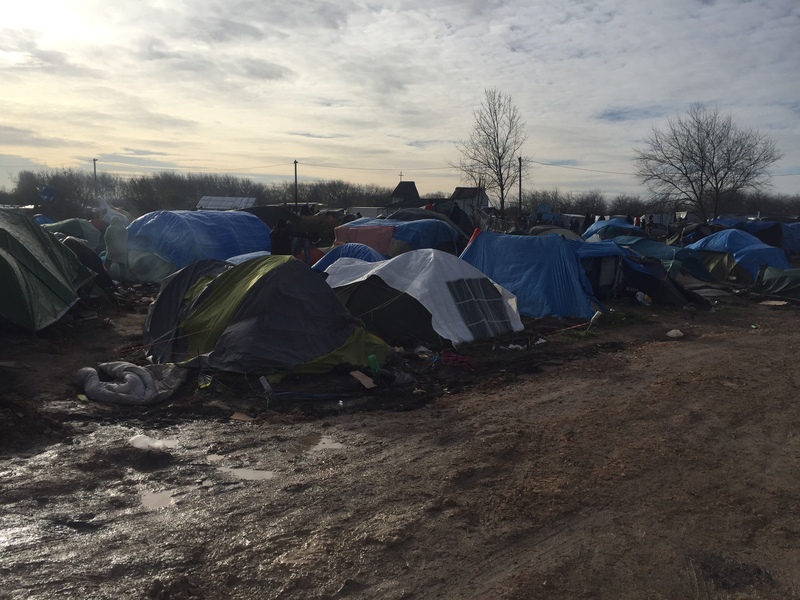 Adam Woodhall visited the migrant camp in Calais in November 2015. In the conversations that followed (particularly one with the MMP’s Sue McAlpine, who is curating Call Me By My Name: Stories from Calais and beyond, shortly to open in Shoreditch, London), he realised that his personal interest in environmental issues, especially drought caused by climate change, was intimately linked to the stories of some of the people in the Calais camp. So here I am, six months after my visit to Calais, happily tapping away on my laptop, in my comfy, warm, dry, safe, settled flat in London, looking through my double-glazed windows onto a calm residential scene. In Calais I had looked into the eyes of people whose journeys I could only dimly envisage. They’d travelled across continents, through war zones, leaving behind family, friends, treasured possessions, hopes and dreams. Here they were now, standing in a puddle, with only the clothes on their back and a dream of safety and a better life in the UK. What was it that kept them here, waiting for fate to finally smile on them? In conversations throughout the UK, whether it be in pubs, coffee shops, on Twitter or in the media, there are many views on this: they were there to ‘take our jobs’, to ‘exploit our benefits’ or, more benignly, to be re-united with family members who were already legally in the UK. Whatever truth there may be in these views, it is only one part of the story of why these individuals find themselves in a cold, wet, miserable migrant camp in Western Europe. There is context, stretching back a decade or more, to the situation they find themselves in – and a significant factor in the narrative of the migrants is their own local environmental crisis. The story of these people goes way back to their birthplace. To a time when they too would look out of their window from their comfortable and dry home, feeling happy, safe and content. For some of them the view they looked out upon would be very different from mine. In my mind’s eye, I see them looking out upon a rural landscape, in a wide Syrian valley. There are fields beyond their village, some with crops, some with animals grazing. The weather is hot, there are children playing and the elders are sitting out on shaded verandas. This is 2006, and something is starting which will change their lives forever. What is starting is an extreme and long-term drought, which in some areas of Syria led to 75 per cent of households* suffering total crop failure. Imagine your local Asda, Sainsbury, Tesco and Morrison’s shutting down, leaving only the occasional corner shop open, and all employment opportunities drying up at the same time. Would you stick around? Or would you move to where there might be some food? A chart showing the increased frequency of drought in the Mediterranean area (Hoerling, M, J Eischeid, J Perlwitz, X Quan, T Zhang, and P Pegion (2012) ‘On the Increased Frequency of Mediterranean Drought’ in J. Climate, 25, 2146–2161; first shown on the National Oceanic and Atmospheric Administration website in 2011). 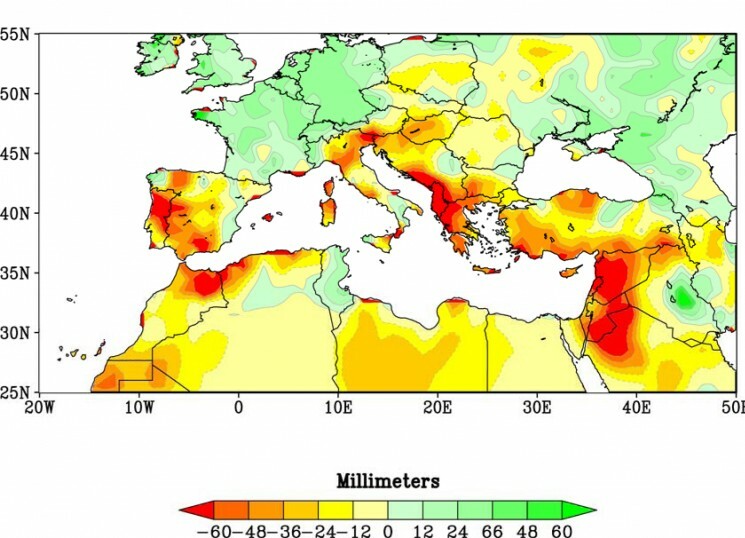 Reds and oranges highlight lands around the Mediterranean that experienced significantly drier winters during 1971–2010 than the comparison period of 1902–2010. For these people, the first step of this journey was having to admit to themselves that living in the place where they had grown up, as had generations before them, was no longer viable. So they moved to a Syrian city where food was more readily available. This unfortunately proved to be out of the frying pan of long-term drought and into the fire of a failing state, with threat multipliers – such as ISIS, the corrupt Assad regime, refugees from the Iraq conflict – all conspiring to light the touch paper of violent protest and then blowing up into a full-scale civil war. 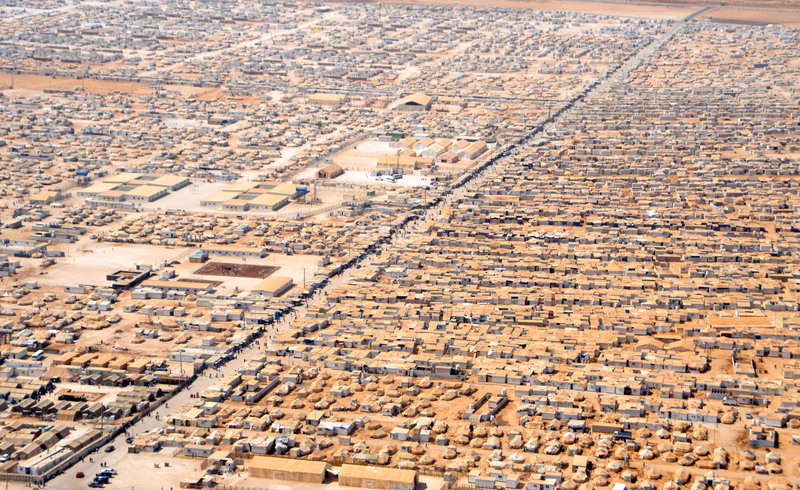 An aerial view of the Za’atri refugee camp in Jordan, whose population was estimated at 83,000 in March 2015. Estimates for the population of the migrant camp in Calais are between 3,500 and 5,500 people. So they move again, this time to Turkey, where they join millions of other Syrians in refugee camps. Here they hear of how things are better in Europe, so they decide to use some of their savings to make the risky Mediterranean crossing to Greece. Arriving in Greece, they find out that a family member is in the UK, and so they decide to trek across the continent to get there. Ten years after the drought starts in Syria, here they are standing in a puddle in Calais, being looked at by me. My story ends with me getting back on a ferry and into my own bed before midnight. Their stories continue to be clear as the mud in that puddle. * This figure is taken from Erian W, B Kaplan and O Babah (2010) Drought Vulnerability in the Arab Region: Special Case Study, Syria, p.15, para 3. Global Assessment Report on Disaster Risk Reduction.